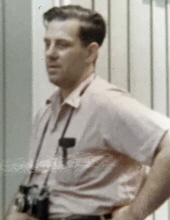 Richard Richter Hamer, 87, of Oak Ridge, passed away Saturday, October 20, 2018 at Diversicare of Oak Ridge. He was born August 7, 1931 in Kansas City, MO, the son of Robert Walden Hamer and Teresa Rose Richter Hamer. He and his mother ran Hamer Office Supply, located at the Anderson County Courthouse in earlier years. In addition to his parents, he was preceded in death by brother, Robert W. Hamer. He is survived by his wife, Linda Hamer; sister-in-law, Helen Hamer and several nieces and nephews, Teresa, Patricia, Virginia, Robert and Joseph. A private burial was held at Anderson Memorial Gardens. To send flowers or a remembrance gift to the family of Richard Richter Hamer, please visit our Tribute Store. "Email Address" would like to share the life celebration of Richard Richter Hamer. Click on the "link" to go to share a favorite memory or leave a condolence message for the family.